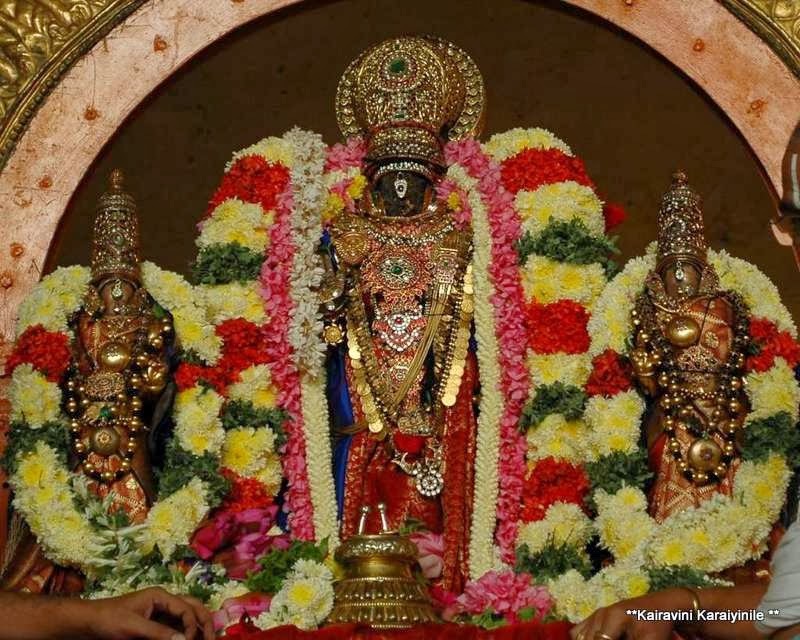 Thiruvallikkeni Ratha Sapthami - Surya Prabai Purappadu 6th Feb 2014. 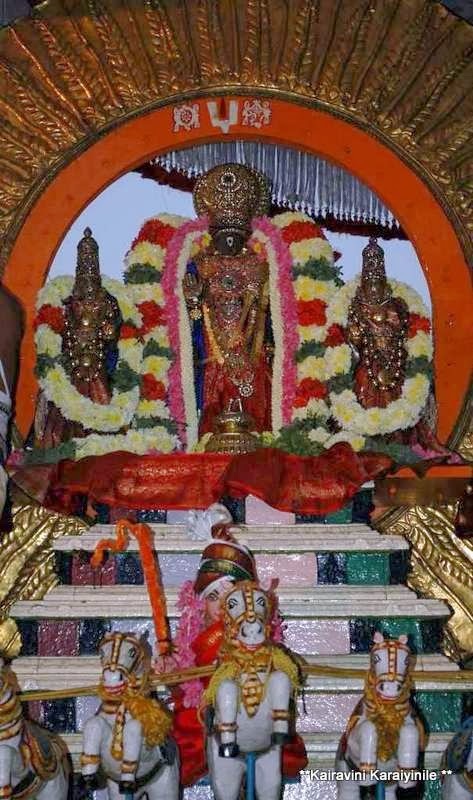 Today – 6th Feb 2014(24th day of Thai masam in Tamil calendar) is a very auspicious day – Ratha Sapthami. Ratha means chariot. Sapthami is a thithi in a lunar month falling on the 7th day of both sukla and Krishna paksha. Ratha Sapthami also Surya Jayanthi is celebrated on 7th day after Thai Amavasai- Shukla paksha (waxing phase of moon) dedicated to God Surya. It is believed that earth’s inclination towards the sun is the steepest on the day. Special bathing rituals are observed in some regions today. Surya (Sun) worship is deep rooted in the Vedas and other Hindu scriptures. Today is celebrated as the birth of Surya to Sage Kashyapa and his wife Aditi and celebrated as Surya Jayanthi in many parts. Legend has it that the greatest warrior Bhishma breathed last the day after the Ratha Sapthami day. The Pithamaha is one the greatest characters in the Epic Mahabaratha and the asthami is revered as “Bhishmaashtami”. The sun god is driven by a seven-horsed Chariot depicting the seven days of the week. Going by Upanishad, their names are : Gayatri, Brhati, Usnik, Jagati, Tristup, Anustup and Pankti. The charioteer of Surya is Aruna, who is also personified as the redness that accompanies the sunlight in dawn and dusk. 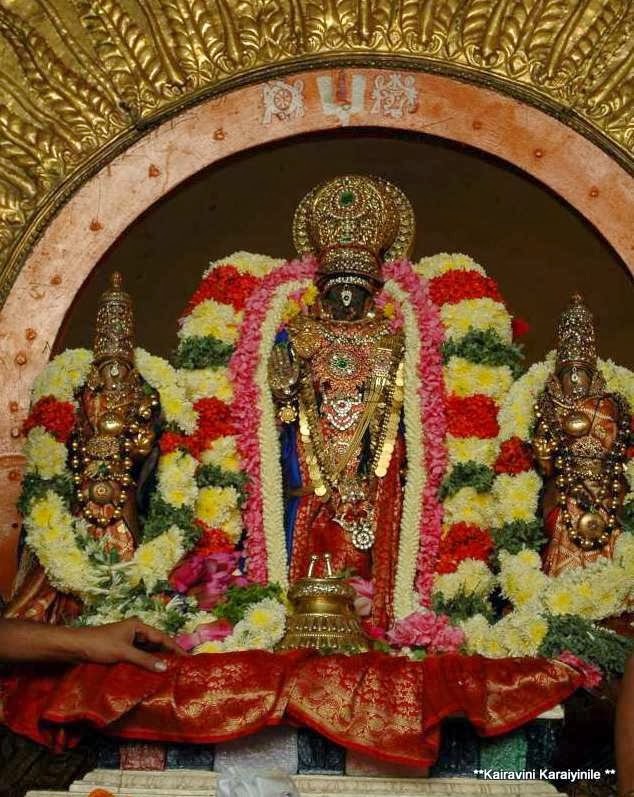 Aruna was born to Vinatai and Sage Kashyapa….. the other son is the most illustrious Periya Thiruvadi (Sri Garuda Azhwar) ~ to Aruna was born Jatayu and Sampati, who are mentioned in the epic Ramayana. Uttarayana is the six month period between Makara sankranti (Jan 14) and July 14 when Sun travels towards North in the celestial sphere. Ratha saptami marks the seventh day following the Sun’s northerly movement of vernal equinox starting from Capricorn (Makara). A journey from Makara rekai to Kadaka rekai – Capricorn to Cancer. Today symbolically represents the Sun God Surya turning his Ratha (chariot) drawn by seven horses towards northern hemisphere in a north-easterly direction. Traditionally in villages, Rangoli kolam is drawn with coloured rice powder depicting Chariot drawn by horses. From today, the days would get warmer, especially in South India. 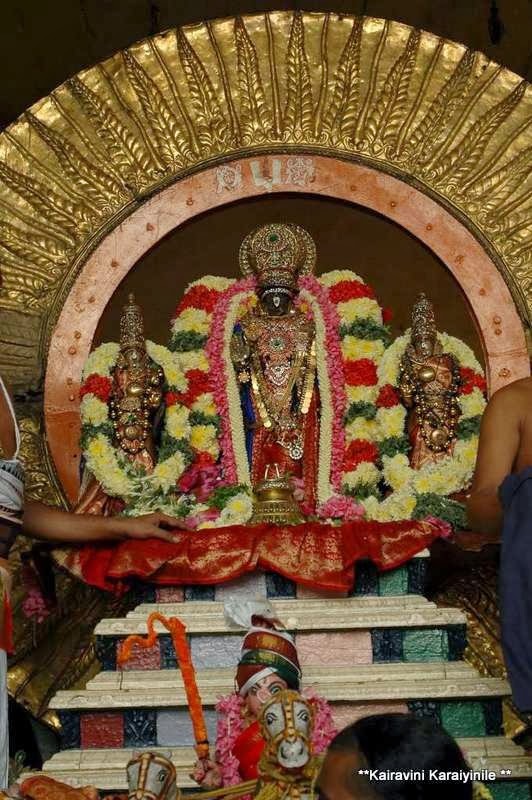 This is an important annual festival at Vaishnavaite temples. 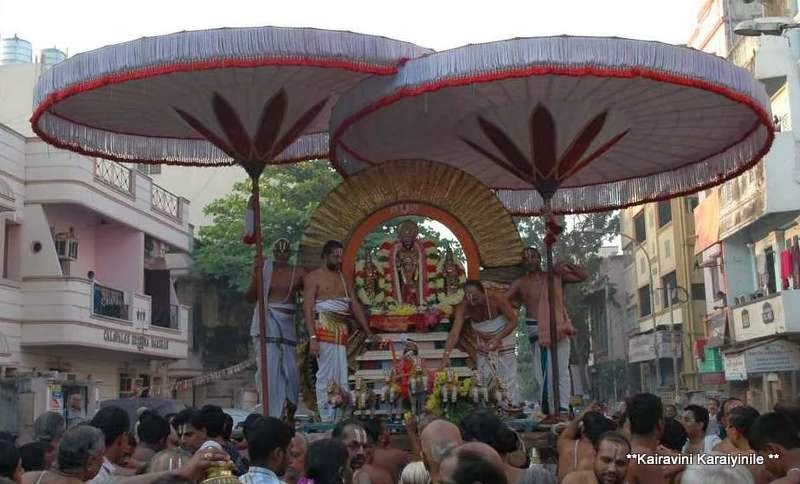 Today, it was celebrated grandly in Thiruvallikkeni also. 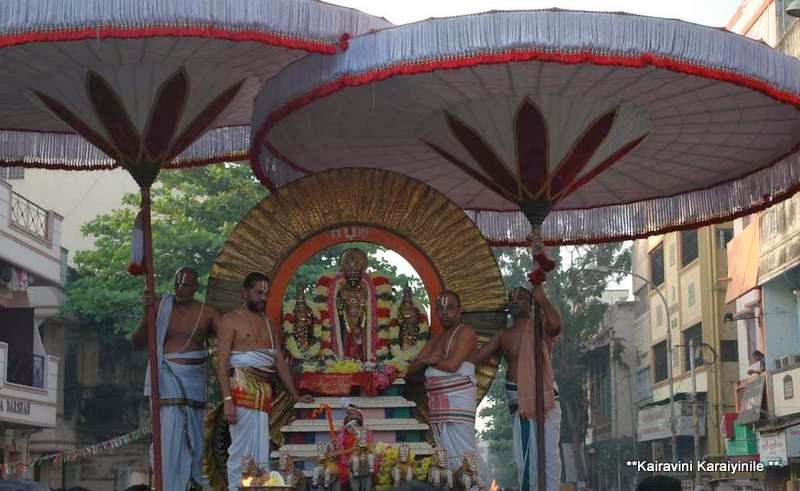 Early morning, Sri Parthasarathi Emperuman had purappadu on Surya prabhai with 7 horses drawing it. . here are some photos taken this morning. In Greek mythology, Helios is the personification of Sun, imagined to be handsome god crowned with the shining aureole of the Sun.